If you’ve ever walked into your kitchen to find your pup face down in their bag of kibble, you’ll know how frustrating it can be. Dog’s pretty much have bottomless stomach, so it seems that, no matter what you do, they will forever be search of more food. Of course, this is only natural to them, so usually it comes to a point that your pet food ends up in a somewhat inconvenient place, purely to stop your pooch attempting death by overeating. What if I told you there was an easier way? We’ve taken the time to find the best pet food containers on the market- those which lock your pet’s kibble and treats out of sight and out of mind, including any delicious smells they may be partial to. Meaning you can keep storing your pets food in plain sight, without the surprise of having no food left, the second you leave you canine companion alone for more than a minute. As always we’ll be letting you know what we love most about the best dog food containers on the market, trawling through countless products, as well as how previous buyers have reviewed them, and doing all the research work on your behalf- so you don’t have to spend hours deciphering each and every pro and con, to each and every pet food containers. Our top pick for dog food containers in this 3-piece offering from IRIS. Made up of a large container (25lbs), a small container (10lbs) and a scoop (one cup), this is the perfect offering for those looking for a reliable, cost-effective plastic food bin for dogs. The larger section is great for holding full bags of dog food, while the smaller can work for either a full bag of cat food or can be used for treats and smaller bits and pieces. With flip-up lids, inbuilt caster wheels and BPA-free plastic, this is an easy to use, easy to maintain solid addition to any dog owner’s home. They’re also stackable, so you know they’re not going to take up too much room in the kitchen, or your preferred storage area. This Vittles airtight container is great if you’re a little short on space. Since the opening comes at an angle (with a screw cap that keeps the food well and truly sealed), it’s easy to stack multiples of these on top of each other. Perfect for those who have two or more dogs to feed, especially if they have their own nutritional regimen. There’s a couple of different sizes available here, so you can choose the best size for your needs, and dependent on where you’d like to keep them. We recommend the smaller versions if you need these in your cupboard or on your countertop- and they even offer some decent discounts on multibuys, too. If you’re looking to splash out a little, then you’ll do well to spend your money on the Simplehuman dog food storage can. Made with stainless steel and looking sleek and stylish, while remaining airtight- keeping smells in and your dog’s nose out! This extra-large food storage bin comes with hidden wheels in the base for easy movement and an ergonomic handle to make dinner time that little bit easier. The flat back sits against the wall, too which makes this a great addition to homes that might be a little short on space. The Vittle Vault upright stackable is very similar to its angled counterpart (number 2 on our list), with a small but might difference. This item sits straight up, so it can be kept upright as a bottle format, or on its side to squeeze into those tight spaces around the kitchen. The material has stayed just as heavy duty, though so don’t worry about any accidents happening- this vault is as secure as the name suggests! Another offering from Gamma2 with a smaller version of the Vittles Vault. This one is perfect for doggy treats and can be combined with both number 4 and number 2 on our list, for extra storage. Another translucent offering on our list now and this dog food container from Snapware works in the same way as any household Tupperware, meaning using this will come almost second nature to those who spend a lot of time in the kitchen. With a free measuring cup and cute pattern across the side, this is the countertop design of the Vaults, which is slightly more aesthetically pleasing. As always though, the quality and materials of the product is just as reliable as ever. Lock & Lock have put all of their time and energy into this design and it shows. There’s an old familiarity with this dog food container, as it follows a similar format to the most Tupperware items around the home. Except this airtight container is patented technology that boasts of being completely waterproof. The angled dog food container can work as a stack, and the translucent materials are BPA free and FDA approved, so you can be sure any stored food items will stay completely safe. It also has an increased durability and heat-resistance, due to it’s strong-willed nature which makes it perfect for storing dog food. This is a lovely, simple food container that comes with a range of adorable coverings to match any color scheme. Being in the medium range when it comes to shape and size, this probably won’t hold a huge bag of food, but it’s still a great way to keep the food locked away from sensitive noses. This is another BPA-free product that sets itself apart with it’s colorful markings, inset wheels and straight back, allowing users to keep it flush with the wall. The Stak-N-Stor offering from Bergan is designed to fit comfortable on any countertop or floor. While it isn’t big on size, the door is can be securely closed and the smallest offering is certainly ideal for treats and dog biscuits. As well as this, they also have a range of sizes, all of which are compatible with each other- great if you’d like to buy the bigger versions, later. A small dog biscuit tin that could easily be confused with a bread bin- this is great for tight spaces such as apartment kitchens. Another option with a cute design and a range of colors available, this is perfect for anyone looking for a simple, cost-effective dog biscuit storage tin, without compromising on quality. The Pet Tower from Richell is an amazing dog food container that comes pre-stacked with a second compartment. 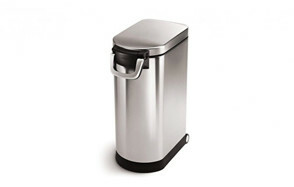 The lower compartment comes with a pedal, so you can use this as you would with any other bin, but the snap-lock lid works in tandem with the movement, so your food remains fresh and odors stay away from your kitchen. Being slimline, this is also perfect for those with smaller kitchens who might otherwise struggle with finding the right place to put their dog food containers. 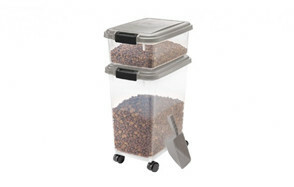 Another option that gives great value for money is the rolling pet food bin from Paw Prints. With hidden caster wheels and an in-built scoop, this is the ideal food container if you’re prone to keeping your dog food under the stairs or hidden behind something in the garage. The lid is gasket-sealed and the plastic is BPA-free, too so you know the food will stay fresher, for longer. The only dog food container on our list that also doubles up as a food bowl, this is another unique, wood-based design that seems to be both a hit and a miss, depending on who you ask. There are some issues with messier dogs getting water in the woodwork and dampening the food, as the storage area itself isn’t waterproof- but overall there are some good reviews on this product from owners who have loved saving themselves the storage space, as well as the design of the food holder and container, combined. Our final option is the metal dog food bin with a great design for dog lovers. This is available on its own or as a set and can be a great addition to any home that appreciates a bulldog. Of course, the design itself isn’t too bad, either. Holding up to 15lb of kibble isn’t a bad feat for a relatively small container and the tight-fitting lid means that your pooch won’t be getting into this pet food container any time soon! The only real negative here is the tin material the item is comprised of. Unfortunately, when tin dents or too much moisture gets into the bin, it’s likely that your food will spoil more easily. However, if you’re likely to keep this out of the way of any incidents, it can totally be worth the investment. There’s a multitude of benefits to using pet food storage, since you’ll inevitably have the same positives as opening up a completely fresh bag of dog food, every time you go to feed your dog. The key is to simply try and get an airtight dry dogfood container. Then you’ll be able to benefit from a range of advantages, including a full length of shelf life. Usually, once you open your pet’s food, the air will inevitably work its way in and the kibble will immediately, if slowly, begin to decompose. This typically means you’ll have to buy smaller bags of pet food, in order to feed your pooch only the best, meaning that you miss on bulk buys and end up spending more money, over time. If you use a large dog food container, however, you’ll be able to get those big bags, as the food will stay fresher for longer. Dog food storage also stops your dog from gaining access to food before he or she should. As we all know, dogs are complete opportunists and will jump on any chance to get some food, no matter what the risks. It’s a natural instinct and completely understandable, if a little frustrating. However, using dry dog food containers keeps those keen noses away from their food- saving you money and stopping your dog from suffering with weight gain. This is especially beneficial for those dogs who are on a strict diet- as too much of a good thing can do some serious harm, in these cases. Dog food bins are also great for keeping out any creepy crawlies, which is great for your sanity but also for your pet’s general health. Imagine coming across a few spider eggs or a load of ants, when going to feed your dog, one day- no thanks. Speaking of keeping things out- mold and bacteria love dog food, because it’s usually stored in damp, warm places- perfect for multiplying. But having dog food storage that keeps out any unusual warmth and moisture can stop these nasties in their tracks, allowing your dog’s food to keep fresher, for longer. With all the added bonuses that having a suitable dog food storage bin adds, it’s hard to argue as to why you wouldn’t want a food container for dogs. Especially when you consider that their prices, even for a one-off purchase, are actually surprisingly low in our top choices. Even with a food container, there are always going to be some minor slip-ups which cause the food bins to fall short of their job, but if you follow these instructions, you can be sure you won’t have any issues. Meaning your purchase won’t be wasted and you’ll have a happy home and happy dog! If the storage bin is big enough, try to store the whole bag of food in the dog food container. If you throw the bag itself away, you’re likely to miss out on some important information kept on the side of the wrapping. Things like barcodes and lot numbers are part of the essential information, if something were to be wrong with the dog. And if there are any recalls, you’ll need to check this info. On top of this, the bag itself is coated with a sealant, which helps the food to stay fresher, for longer. Dry food should usually be finished at around the 6-week mark and the best before dates will usually indicate when that is, so pay attention to those dates marked on the side of the bag. You should also keep your storage container somewhere that’s cool and dark, to avoid sun-bleaching or the food being broken down by the heat. Give your dog food containers a rinse out between each new purchase. Especially if you are working your way onto a new brand. This is good practice to keep out cross-contamination and also means your food will stay fresh, due to the lack of dust from the previous bag of kibble. Oils and fats also have a bad habit of settling at the bottom over time, so wiping these away keeps these from stagnating. What Type of Material is Best for Dog Food Storage? Metal is a classic that works well for storage. They tend to be easy to clean and easy to maintain. Providing you aren’t keeping your containers in a damp area, they’re likely to have a good longevity. They also tend to be surprisingly lightweight, while also looking sleek and stylish. If you have a modern kitchen, this material would work perfectly. One thing you should be aware of, is that any dents or malformations in the metal can easily become dangerous, and it’s advised that, should your metal container become damaged, you should recycle it and buy yourself a new one, to avoid anything toxic getting into your dog’s food. Plastic, on the other hand, tends to be cheaper for starters. They’re also extremely lightweight and tend to be more airtight than their metal counterparts, since they usually come with rubber seals and lock-lids. In warm conditions, they won’t get as hot as metal and therefore your kibble is less likely to spoil. On the other hand, most plastic containers tend to be opaque, so food can become sun-bleached this way. You’ll also need to look out for cheaper makes- for the best plastic, you should look out for types that are BPA-free, as these are less likely to carry harmful materials which can cause serious damage over time. Q: How long can I leave a bowl of dog food out? A: There are a few factors to consider here. If you’re looking for dry dog food/kibble, you could technically leave a bowl of dog food out through the day and base the dog’s intake on how many cups they should have. Don’t leave your dog food on the floor for longer than a day and be sure to replace any uneaten food, for the next day (if you dog has a sudden lack of appetite, be sure to ring your local vet about ways to help with this). You can also give your dog a time-limited amount to eat. This would mean putting smaller bowls of food down, through the day, at the same time each day. This gives your dog a routine and also works well for house-training your puppy, as they’ll usually need the bathroom shortly after having their dinner! If you’re choosing wet food, however, you shouldn’t allow the food to stand for longer than an hour. Not only would this attract flies (yuck) but the food quickly turns foul and can cause stomach upsets in your pup. Q: How long can kibble last in an open bag? A: Kibble bags are treated in order to prolong the food stored inside, and most dog food makers advise generally around 6 weeks before the food goes bad. If you do leave your kibble in an open bag, be sure to try and wrap the top, to limit the amount of air available to the inside of the dog food bag. Q: What temperature should dry dog food be stored? Q: Can dry dog food go stale? A: Absolutely. Imagine an open bag of dog in the same way you’d picture an open box of cereal. You might be OK leaving the bag open from time-to-time but it’s not going to taste too great if it’s open for a while, or if you leave their food out for an extended period. Even though there are some great options on our best buys, we decided to go with the IRIS stackable dog food containers as it’s hard to turn down such a great offering at such a good price. 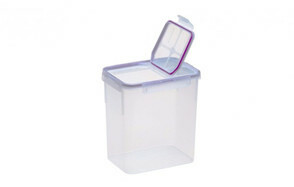 This is a great addition for any pet owner looking to store their pet’s food in plastic container. It’s easy to maintain, comes in a range of colors and holds a huge amount of food. Plus, the scoop with easy-to-measure half cup increments and the added bonus of the extra, stacked food bin was too much to pass by- we hope you’ll agree!